If you want a brief summary, key insights, and the correct pick for each bowl without having do the research, then look no further. In fact, you should bookmark this on your phone so that when the Black and Decker Toilet Bowl happens to be on your TV this Holiday season you can quickly chime in that “due to player x’s decision to sit out, I think that Maryland Boy’s College State University will have the edge.” While the majority of your family will be amazed by your depth of knowledge, your kid brother will be acting like Eli watching Peyton during Super Bowl 50. Also, I am posting all my picks in the Capital Bowl Mania Contest on ESPN. Click here to see my straight picks and here for my confidence scoring picks. Feel free to join and compete! Grambling lost it’s first game to Tulane and has been unbeaten since. North Carolina A&T is perfect on the season, winning against their singular FBS opponent, Charlotte. Grambling won last years matchup, so look for NC A&T to get revenge behind QB Lamar Raynard and finish with a perfect season. This will be an entertaining game to watch, but don’t bet on NC A&T to be able to cover the spread. North Texas I am so glad that we (Army) are not playing you again. That would mark four times in two seasons. North Texas has a great offense that ranks 14th in the nation in scoring against winning FBS teams. Unfortunately, their defense gives up 43 points per game to those same opponents. Troy, on the other hand, is ranked 8th nationally in points allowed behind Alabama and Auburn. This will be the second game they win in Louisiana this year (looking at you LSU). The Hilltoppers have dropped from 11-3 last season to 6-6 after losing their head coach to Purdue. They will beat Georgia State by riding the pig slinging arm of Conference USA’s top passer, Mike White. Georgia State’s defense has not been good all season and they really only have one playmaker on offense with their 1,000 yard sophomore WR Penny Hart. This is one of the games that I don’t have the highest confidence in because there are several factors in play. Oregon’s Star QB will be back in action. Before missing 5 games due to injury, the Ducks Offense rivaled Oklahoma’s. Their starting running back, Royce Freeman, will be sitting out the game. That is offset by the fact that Boise State’s starter likely won’t be playing either due to injury. The big question is how will the Duck’s perform under their new interim head coach after Willie Taggart’s departure to FSU. Will it be enough to overcome the underdog/lack of respect/no one’s giving us a chance feeling that 10-3 Mountain West Champion Boise State has? My gut says yes…Ducks will score too much for one-dimensional Broncos to keep up. Colorado State offensive is better but Marshall’s defense is better. The Rams offensive advantage will outweigh the Herd’s defensive one. Colorado State is fueled by arguably the nation’s top receiver in Michael Gallup. Watch out, this could be a high scoring contest. Arkansas State should be able to outscore MTSU as long as Justice Hansen takes care of the football. Plus the Red Wolves will be playing for their coaches wife who has been battling against breast cancer this season. The matchup features two coaches son’s: Bowden and Lane Kiffin. This is probably that most lopsided matchup of the bowl season. The Lane Train’s record-setting offense is rolling and the Zip’s Defense allowed 45 points in the MAC Championship Game. SMU is going to score a lot of points. They have a pair of 1,000 yard receivers and a great team turnover margin. They average 40 points per game against winning FBS Teams and give up 40 points. LA Tech scores 22 points per game while only giving up 30. Also, LA Tech technically isn’t technically a winning FBS Team at 6-6, so SMU could exceed 40. If you want to see a shootout, this is your game. FIU has the better record but Temple has played a tougher schedule. Geoff Collins’ has the Owls playing well as they went 3-1 in their last four games with a loss against UCF. This will be a very competitive game between two first-year head coaches. This is actually one of my favorite bowls because of the crazy 2014 inaugural matchup between Western Kentucky and Central Michigan. Central Michigan scored 34 straight points in the fourth quarter, including an incredible Hail Mary hook and latter touchdown (see here), but lost to WKU by one point. Anyways, Ohio could have been in the MAC Championship against Toledo (who they beat earlier in the year) if they had only beaten Akron in their second to last game. UAB has done incredible in their first season back in over two years. Pick: Ohio redeems themselves after losing their last two regular season games. Both these teams struggle to move the ball because they can’t convert on third downs, they each have quarterbacks with tremendous hype and talent, and they each own defenses that are great at taking the ball away. Central Michigan has the better Offense, but Wyoming has the better defense. If one team gets down early, they are in big trouble. This honestly will probably be one of the worst bowls to watch. This game has the potential to be close. Tech is riding high aftering beating Texas, effecting saving their coaches job. Will their momentum and turnover seeking defense be enough overcome Quinton Flowers high powered offense. The Birmingham Bowl is surely a disappointment for USF since they were only one win away from being in the New Year’s Six Bowl. Pick: USF and Quinton Flowers get their 10th win of the season. Read detailed analysis of this game here. Pick: Army executes perfectly and wins. Although the name may sound cheap these two group of five teams are both conference champions. Expect Toledo to avenge last years bowl game loss to the Mountaineers. Logan Woodside, who has already thrown for over 3,400 yards, will help the Rockets get going early. Appalachian State won’t be able to keep it tight as their ground game isn’t as good as it was last year. Utah coach Kyle Whittingham’s record in bowl games is 10-1, which is the best win percentage in bowl games in NCAA history. The Utes may be 6-6, but they lost to Washington by three points, USC by one, Stanford by three and Washington State by eight. Count on Whittingham to beat a West Virgina Team that is missing their star quarterback Will Grier. UT fans may be asking why coach David Cutcliffe decided to stay at Duke. No matter the answer, the Blue Devils will be looking to achieve a winning record for the fourth time in Coach Cutcliffe’s fifth season. They will be able to slow down Northern Illinois run-first offense. With the UCLA coaching staff on their way out, I like the Wildcats and their 78-year-old coach’s chance. Even with Josh Rosen, I don’t think the Bruins find any water in this cactus. Pick: Kansas State in a close one. It has been a let down of a season for FSU, who had to win their last three games to keep their 36-year bowl streak intact. Then they lost their head coach Jimbo Fisher to Texas A&M. You might think motivation would be a factor in this game, but the Seminoles brought the fire for interim coach Odell Haggins last week. Unless Brett Farve is suiting up again, Southern Miss will not upset the Flordia State and cause them to have their first losing record since 1976. Even though Boston College has won five of its last six games, the Hawkeyes will avenge their last two bowl season meltdowns. Remember that they completely crushed Ohio State and only lost to Penn State by 3 points. Pick: Purdue in a close one. Tom Herman’s first season at Texas hasn’t gone as planned, but a win here could end their bowl drought. Both teams could benefit from this postseason springboard game. I don’t expect the Longhorns to be able to keep up with Drew Lock and the Tigers. He is one of the most prolific passers in the FBS throwing for 3,695 yards with 43 touchdowns and 12 interceptions. They have won their last six games after starting 1-5. Pick: Make it 7-0 with a Missouri victory. This is basically the only thing has to play for now after Army beat them for the second straight year. Virginia will be motivated since it hasn’t played in the postseason since 2011, but this game is being played in Navy’s Stadium. Pick: Mids should win in a close one. Oklahoma State quarterback Mason Rudolph led FBS players with 4,553 passing yards, 35 touchdowns, and 9 interceptions. I don’t think Bud Foster and the Virginia Tech’s defense will be able to slow down the Cowboys. Both Standford’s offense and defense are better than TCU’s against FBS teams with winning records. Quarterback K.J. Costello will also make improvements during the bowl practices. Pick: Vegas thinks otherwise, but I’ll take Stanford here. This bowl game gets the award for having the longest name. The best part of this bowl will be Mike Leach’s pre and post game media conferences. The defenses are about the same here, but Washington State’s offense is better. NC State is more talented. Their coach, Dave Doeren turned down Tennessee to sign a contract extension at NC State. His team will be led by defensive end Bradley Chubb who won the Bronko Nagurski Award as the country’s top defender (He’s also pretty good at stealing towels). Kentucky hasn’t won in the postseason since 2008. Northwestern is on a seven-game win streak and looking to achieve 10 wins for the third time since 2012. This game will be better than their first meeting in 1928 where Northwestern won 7-0. Northwestern’s Justin Jackson has gained more than 1,000 yards in each of his four seasons. New Mexico State is playing in their first bowl game since 1960. New Mexico State Aggies QB Tyler Rogers is second in the nation in passing yards per game. They are a lot more fired up to be in a bowl game than Utah State is, but no experts are picking them. ESPN is only giving them a 36.9% chance of winning. Pick: I’m taking New Mexico State in an emotional win. The Buckeyes haven’t defeated the Trojans since a 42-21 win in the Rose Bowl after the 1973 season, in fact, they’ve lost seven straight. This is one of the most intriguing games outside the playoff between traditional powers. Both teams will be trying to prove why they should have been in the playoff. Pick: Ohio State will make that statement, USC knows they really didn’t have an argument. 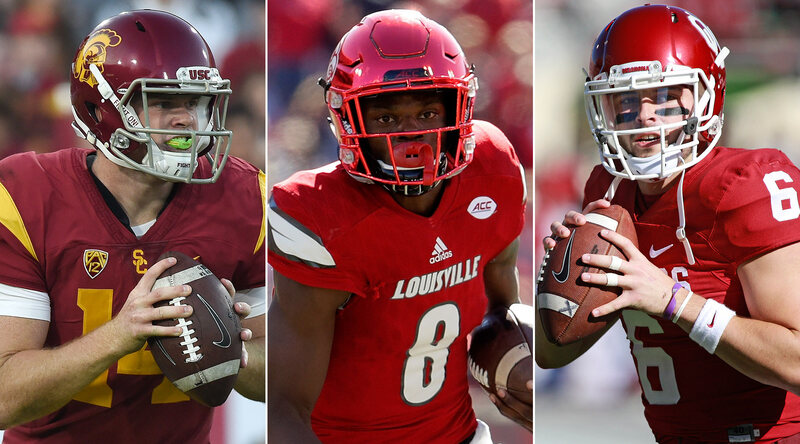 This might be your last chance to watch Louisville quarterback Lamar Jackson, the 2016 Heisman Trophy winner, who was just as good this season. The Bulldogs will also be without quarterback Nick Fitzgerald and former head coach Dan Mullen. 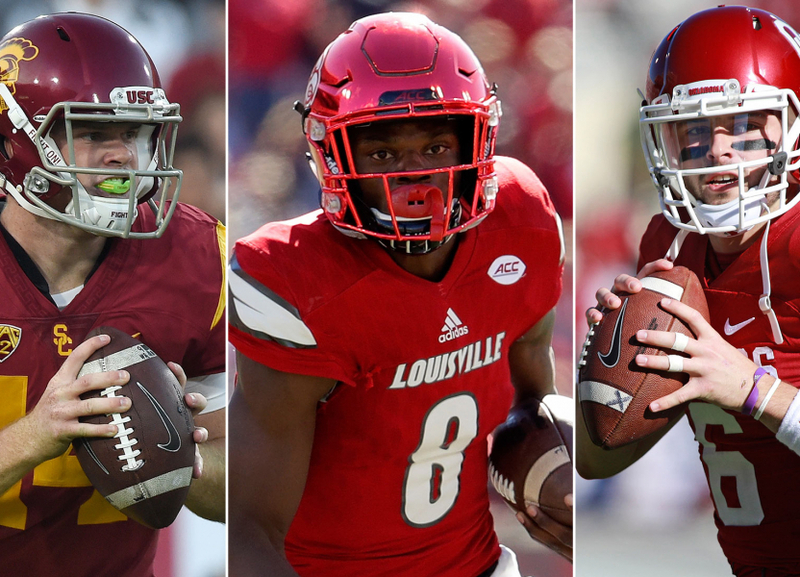 Pick: Louisville rolls on in Lamar’s showcase. Riley Ferguson, Anthony Miller, and the Tigers will be playing in their home stadium. Iowa State will be up for the challenge as it has beaten two top-five teams this year. The Tigers went unbeaten at home and are hungry for a win after dropping the Conference Championship game to UCF. Penn State has lost their last two bowl games, but they’ve never lost three straight postseason games. They have also won each of their previous six appearances in the Fiesta Bowl. Saquon Barkley will be squaring off against Vita Vea and Washington’s excellent defense. Trace McSorley and Jake Browning will provide one of the best QB matchups of the bowl season. The Huskie’s are 0-2 all-time against the Nittany Lions. I don’t really care how good Wisconsin’s defense is, how good their running back is, or what they have to prove after losing to Ohio State. The Cane’s are at home and the Turnover Chain is coming out. Miami has a lot to prove after they lost at Pittsburgh 24-14 and then fell 38-3 to Clemson in the ACC championship. That would be prediction number 41 and I only promised 40 in the title. Don’t worry, I will break down both CFP games and the National Championship in detail soon!